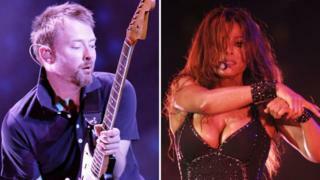 Radiohead, Roxy Music and Janet Jackson will join the Rock and Roll Hall of Fame next year, alongside Def Leppard, The Zombies, Stevie Nicks and The Cure. The seven inductees are the biggest intake since 2004; and bring the total number of acts in the hall to 330. Nicks was already a member as part of Fleetwood Mac; and becomes the first woman to enter the Hall of Fame twice. "To be recognised for my solo work makes me take a deep breath and smile," she said. "It's a glorious feeling." Artists are eligible for the Rock and Roll Hall of Fame 25 years after the release of their debut album. Def Leppard, Roxy Music and Stevie Nicks were all accepted the first time their names appeared on the ballot. Janet Jackson got in on her third attempt - finally earning a place alongside her brothers in the Jackson 5, 21 years after their induction. The star, whose hits include Rhythm Nation, That's The Way Love Goes and Together Again is one of America's most successful female artists; and the only singer in US chart history to have three albums that each contain at least five top 10 hits. "We did it u guys 💜 Thank U for all your love and support," she tweeted after her place was secured. In a separate statement, the star added: "Thank you Rock and Roll Hall of Fame. I am truly honoured and I am happy to be in there with my brothers." But Jackson didn't have to wait as long as British psych-rock band The Zombies - who have been eligible since 1989 and appeared on three previous ballots. "You do start to doubt that it could happen," singer Colin Blumstone told Rolling Stone. "I've tried to be fairly philosophical about it and tell myself that if we don't get inducted, it's just a bit of fun. "But of course when you're actually inducted, everything changes. You think, 'This is a career-defining [and] life-defining moment.'" Artists who didn't make the cut this year include LL Cool J, Rage Against The Machine and electro pioneers Kraftwerk. Meanwhile, Def Leppard could owe their place in the hall to an online vote. The British rockers, whose hits include Animal, Rocket and Pour Some Sugar On Me, received 547,647 votes, followed by Stevie Nicks (427,844) and Todd Rundgren (365,370). That gave them one extra vote on top of the ballots cast by the Hall of Fame jury, which includes about 1,000 musicians, critics and historians. Their inclusion comes at a fortuitous time. Whereas frontman Joe Elliott once said the band would "politely refuse" a place, he recently had a change of heart, telling Billboard: "When I look at the list of who's in, it's just obvious you'd want to be in that club,"
If anything, Radiohead are more likely to be a no-show at the ceremony. "I don't want to be rude - but if you ask me what I'd rather be doing that night, I'd rather be sitting at home in front of the fire or going to a gig," said guitarist Ed O'Brien when asked about the band's nomination. Bassist Colin Greenwood was more positive, telling Rolling Stone he'd be "grateful" to win the accolade, while admitting the rest of the band might not share his enthusiasm. "I don't know if everyone else will go," he said. "It might be me just doing bass versions of everything like, 'Come on, you know this one!' I'd have to play the bass part to Creep five times." The induction ceremony will be held at Brooklyn's Barclays Center on 29 March, 2019.